Training in massage therapy. Located in Eaton, Colorado. Massage therapy resources including details about massage therapists, bodyworkers, massage therapy schools, associations, license and certification requirements, continuing education. Located in London, Ontario. Programs offered in massage therapy. The Institute has a School of Massage Therapy for human massage and a School of Equine Massage Therapy, the only registered program of its kind in North America. Courses and therapy in Swedish and sports Massage, lymphatic drainage, trigger point, cranial sacral and Massage for Good Health in Redding, California. Offers national workshops, massage therapy books and videos, certified Massage School, distance learning, and home study. Offers an accredited massage therapy program and lifetime career services assistance to graduates. Offering 1,000 and 2,200 hour programs in massage therapy. Located in Alberta, Canada. Courses in Therapeutic Massage and Shiatsu Therapy. Located near Reading, Pa.
Offering a 520 Hour Massage Therapy Curriculum. Laurie Jervis of Pampered Pony offers Certified Equine Shiatsu Massage Therapy and years of licensed massage therapy experience to horses in Santa Barbara Ca. and surrounding areas. Animal Massage Therapy to help injured and abused animals return to normal activities and live a happier life. Massage School in Taos, New Mexico. Shiatsu, sports massage, meditation, body-mind clearing. Registered with the NM State Board of Massage Therapy. Liz Vazquez - Doula, BellyCasting and Massage Therapy in Austin, TX. Information on massage therapy and neuromuscular therapy as a treatment option for back pain. Providing professional massage training with a 600 hour program. The program emphasizes Swedish massage and certification in CPR and first aid. Day, Evening and Part-time class schedules are available for certification in Therapeutic Massage, Medical Massage & Spa Therapy in Montgomery, AL. Restoration and maintenance of horse and rider through massage therapy. Certified massage therapy team. Located near Chapel Hill, North Carolina. Schools of Massage Therapy and Acupuncture. Founded in 1916, the Swedish Institute is the oldest school of massage therapy in the United States. Based in New York. A non-profit massage therapy school in Lewiston, Maine. A strong balance between the Art and Science of bodywork is emphasized. Licensed school offers bodywork massage therapy education with therapist training programs, workshops, massage continuing education classes and seminars for the Bay area. Chair massage therapy in the workplace. Specializing in calls centers, as well as employee recognition and incentives. Offers a 540-hour massage program designed to prepared students for the NCBTMB exam. A 1500 hour Pennsylvania State Licensed Massage School, offering training in many massage therapy techniques. Massage, Touch Therapy and Reiki for cats and dogs. Helps improve arthritis or injuries, plus calms animals when transitioning to a new home. A 100-hour certification program in massage, including deep tissue, located in Bell Gardens, CA. Classes in English and Spanish. (AICM) Offers a full curriculum of professional massage therapy and continuing education courses. Located in Post Falls, Idaho. Canine Massage Therapy, Rehabilitation and Swim Therapy. Acupuncture, occupational therapy and massage therapy in Annapolis. Ivan Anderson offers therapy. Description of practices and contact information. Offers courses in Massage Therapy, Polarity Therapy, and Kinesiolgy. If the business hours of Academy of Natural Therapy in may vary on holidays like Valentine’s Day, Washington’s Birthday, St. Patrick’s Day, Easter, Easter eve and Mother’s day. We display standard opening hours and price ranges in our profile site. We recommend to check out natural-therapy.com/ for further information. 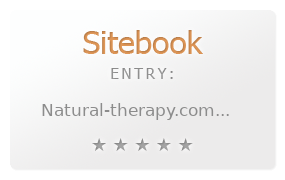 You can also search for Alternatives for natural-therapy.com/ on our Review Site Sitebook.org All trademarks are the property of their respective owners. If we should delete this entry, please send us a short E-Mail.